Starting middle school brings all the usual challenges — until the unthinkable happens, and Fern and her family must find a way to heal. Jo Knowles is the author of the YA novels Lessons from a Dead Girl and Jumping Off Swings. The recipient of the 2005 PEN Literary Award, she lives in Vermont. SEE YOU AT HARRY'S offers, on the one hand, a deft and delicate handling of commonplace traumas — how to negotiate bullying on the school bus, what it means for everyone in a family when a teenager comes to terms with his sexuality — and, on the other, the enormous and mercifully rare drama of a child’s accidental death. And while the distinction between these narrative elements — their disparate weights — may seem to an adult huge, Knowles is aware that a child’s perspective is somewhat different. Sit back in a comfortable chair, bring on the Kleenex and cry your heart out... Prescient writing, fully developed characters and completely, tragically believable situations elevate this sad, gripping tale to a must-read level. This novel is reminiscent of classics like LITTLE WOMEN in its exploration of the often difficult, always powerful bond among siblings. Despite its classic, timeless themes, however, it also touches on such contemporary issues as the dangers of bullying and sexual orientation... Young readers will eagerly turn the pages of this perfectly paced novel and will care deeply about what happens to Fern and her siblings. The story is so authentic and captivating that readers will come to love Fern’s family and feel a part of it. When tragedy strikes, readers will feel the blow almost as intensely as the family does. Readers will savor every bite of this bittersweet novel. Through the eyes of Fern, Knowles introduces a cast of distinct, fully developed characters who exhibit authentic emotions, foibles, and expressions of love. Readers will feel deeply for the family in the aftermath of the plot's heart-wrenching turn, which pulls them closer together. Highly recommended for readers dealing with their own grief issues, but any teen can benefit from the reminder that family can be simultaneously humiliating and invaluable. This is a powerful, spare portrait of a flawed but loving family that experiences the unthinkable—and survives. Knowles paints a moving and authentic picture of a family grieving. This simple, sad, sweet book deals with many issues but does not overwhelm the reader. Knowles conveys grief, family relationships, friendship, and teen angst with dexterity and sensitivity. This is a must for middle grade collections where heartbreak is always a hot topic. Sometimes your heart has to break before it can heal. SEE YOU AT HARRY'S will make you weep, but it will also fill your soul with the extravagant gift of love. This may be the most beautiful book ever. Heart-breaking, soul-sustaining, and all-around beautiful. SEE YOU AT HARRY'S is one of the most beautiful, moving books I've ever read. Full of laughter, love, and tears, it will break your heart and put it back together again, with a little more light, a little more hope than there was before. This story of an imperfect but loving family and how it holds together through shattering tragedy as well as everyday complications is full of true heart. Jo Knowles' love for her characters shines through on every page. SEE YOU AT HARRY'S is a beautiful, deeply moving story-one never shying from the flawed truths that come from being part of a big, messy family. I finished the book the way I do every Jo Knowles novel: holding it close, not wanting to let go. Jo Knowles writes a family you know in your bones-their routines, rituals, petty gripes, recurring jokes-which is why it about kills you when something equally real and terribly unexpected threatens their very existence as a family. Thankfully, Knowles brings hope-first a flicker, then a big, booming beacon of it. I loved it. Jo Knowles has crafted a shimmering, pitch-perfect novel of love, loss, and resilience which finds the beauty in the small joys of everyday living, the comfort in the often-infuriating bonds of family, and the gentle hope that grows from the heartbreak of tragedy. Beautiful and life-affirming. The story, as told in Fern's voice grabs, at the heart with its unfathomable anguish. Uniting many separate plots, the author creates flawless flow, in-depth characterization, and dialogue that all give superb insight into an average, loving family having a difficult time. 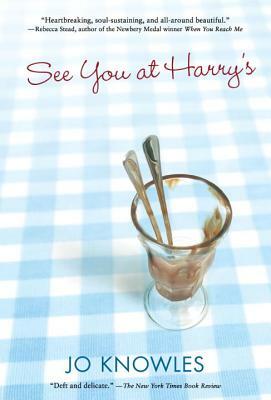 Powerful and gut wrenching, SEE YOU AT HARRY'S by Jo Knowles is heartrending. Readers will take these authentic characters to their hearts in this powerful story of loss and love.